Boopsie! Making Mobile Search & CTIA Wireless 2008 Better! I've only attended maybe a dozen or so big tradeshows in my life, so for me the excitement and novelty hasn't worn off just quite yet... I'm pumped to be heading to CTIA Wireless 2008 in Las Vegas in T-minus 29 hours. But as excited as I am to be heading to CTIA, the thing I have not been looking forward to is having to lug around the guide book I'm sure to receive when I register onsite and get my event pass... you know, the 4lb book that'll say where all the exhibitors are and give me the information on all the keynotes and session times, etc. Well, an hour ago I discovered I won't have to worry about lugging around that dead weight anymore as Boopsie has done up a custom application called myCTIAshow. If you're not familiar with Boopsie, you should check them out. They are the "pioneers" of Smart Mobile Search. Basically, they identified the most searched categories/topics out there, and utilizing their "Smart Prefix" technology have set up the app so that as you type your search terms the results are displayed on the fly, allowing you to quickly find what you are looking for the first time around. The app is available for the BlackBerry, works pretty well, and best of all is FREE, so I suggest giving it a try. 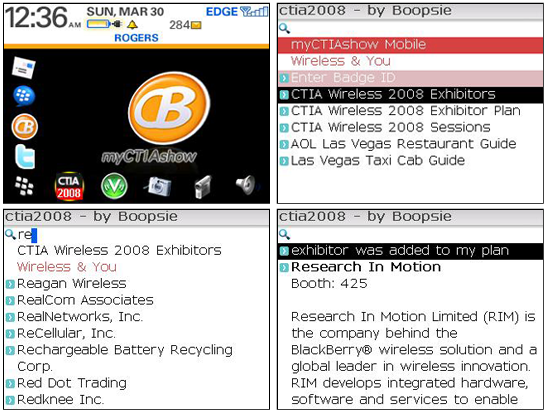 With the myCTIAshow app, Boopsie has gone ahead and directly applied their technology to the world of tradeshows. It's totally useful. Let's say I want to find out where Research in Motion's BlackBerry booth is among the thousands of exhibitors on the show floor. Instead of flipping through a book, I simply open the app, go to exhibitors, and start typing the name of the company I want to find. In the case of RIM, all I had to type was the R-E-S and then Research in Motion popped up. From there I could view their booth number, and the application even allows for me to add them to my Exhibitor Plan - essentially saving the results so I make sure I remember all of the companies I look up. You can also find session times, dates and locations and even use the app to book a local restaurant. And though I haven't tried it (Freedom Keychain 2000 is charging up right now), it seems Boopsie can tie into GPS to really help you locate things. WAYY COOOL Boopsie. Thanks to you CTIA Wireless 2008 is off to a great start and I haven't even arrived yet!